Offers: Golf du Barriere hotel group make many substantially discounted 'Stay & Play' offers plus discounted packages and green fees available from golf holiday agents. 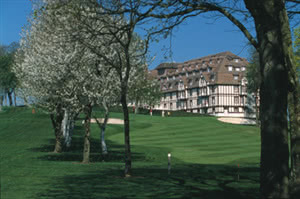 Canisy, just south of Deauville, and surrounded by 27 holes of superb parkland golf. The original 18 hole course was desinged in 1929 by Tom Simpson with a further 9 holes being added by Sir Henry Cotton. Whilst they are now considered 3 loops of 9 holes the usual 18 combines the 'Rouge' course (part of the Tom Simpson 18) with the 'Blanc' course (designed by Sir Henry Cotton). The three courses fit well together, all are maintained to a high standard and offer good width lightly tree lined fairways, little water but fearsome greenside bunkers. The Blanc course (usually the back nine of the eigtheen) offers stunning views down into Deauville.